It was another good year on the hill with excellent weather all day. Fifty cyclists attempted the Fargo Street Hill Climb this year. Thirty-seven made it to the top. There were no successful women climbers this year. The most climbs this year by a single rider was George Holsteinat 60 completions. Our youngest successful rider was Cole Horriganat 15 years of age and our oldest rider was Dale Lehmanat 72 years young. It would appear that age does not matter. The average age of the successful climbers was 46.0 years while the average age of unsuccessful climbers was 46.9 years. The average age of all climbers was 46.3 years. The complete list of successful climbers is below with the number of climbs made next to their name. *Terry Peterson was riding a unicycle and Chris Branson and Bryan Pate were riding an “ElliptiGo.” There are many photos of this year’s event on the internet, including some YouTube videos. 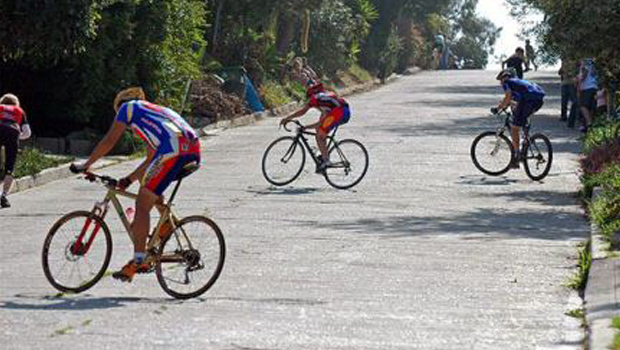 Simply Google “2013 Fargo Hill Climb” to find these.